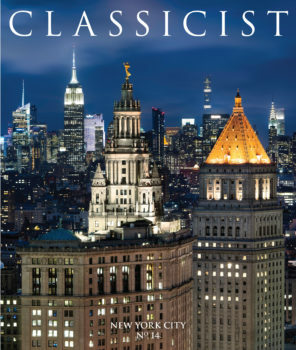 Focused on New York City, the Classicist No. 14 details the city's architectural history as well as contemporary examples of classical design through professional and student portfolios as well as academic articles authored by leaders in the field. Contributors include Guest Editor Charles Warren of Charles Warren Architect; Allan Greenberg of Allan Greenberg Architect; Stephen Alesch and Robin Standefer of Roman and Williams; and Robert A.M. Stern, Founder and Senior Partner of Robert A.M. Stern Architecture and former Dean of the Yale School of Architecture. This beautiful, color-illustrated journal serves as a forum for contemporary classical practice as well as a source of inspiration and information for students, practitioners, teachers, patrons, and enthusiasts. Size: 9.75 in x 11.25 in.